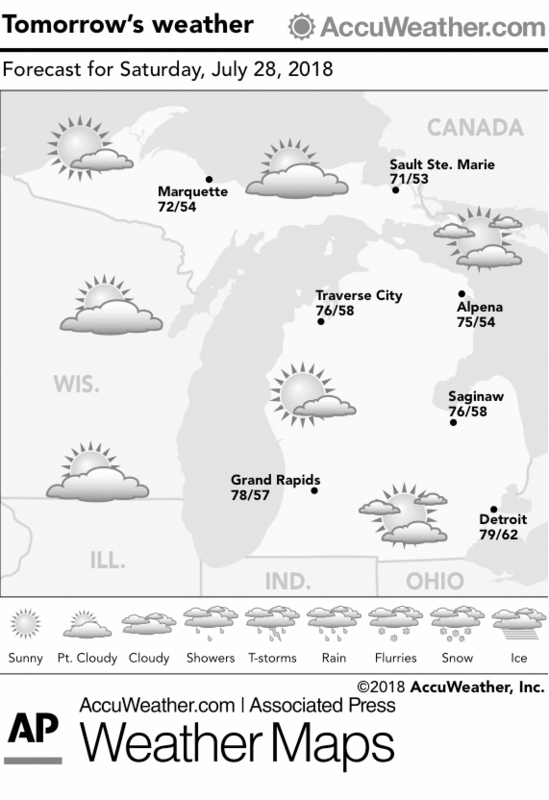 Marquette and vicinity: Today: Sunny, with a high near 73. West wind around 5 mph becoming north in the afternoon. tonight: Partly cloudy, with a low around 59. East wind around 5 mph becoming southwest after midnight. Sunday: A slight chance of showers, then a chance of showers and thunderstorms after 2 p.m. Mostly sunny, with a high near 76. West wind around 5 mph becoming north in the afternoon. Chance of precipitation is 30 percent. Sunday night: A 30 percent chance of showers before 8pm. Partly cloudy, with a low around 57. Monday: Sunny, with a high near 78. Monday night: Mostly clear, with a low around 59. Extended forecast: Tuesday: Sunny, with a high near 78. Tuesday night: Mostly clear, with a low around 58. Wednesday: A chance of showers. Partly sunny, with a high near 68. Wednesday night: Mostly cloudy, with a low around 53. Thursday: Mostly sunny, with a high near 69. Thursday night: Mostly clear, with a low around 54. Friday: Mostly sunny, with a high near 77. Lake Superior: Today: Variable winds 5 kt or less. Sunny. Waves 1 ft or less. Tonight: Variable winds 5 kt or less. Partly cloudy. Waves 1 ft or less. Sunday: Variable winds 5 kt or less. A chance of showers and thunderstorms after 2 p.m. Waves 1 ft or less. Sunday night: Variable winds 5 kt or less. A chance of showers and thunderstorms before 8pm. Waves 1 ft or less. Monday: Variable winds 5 kt or less. Sunny. Waves 1 ft or less. Monday night: Variable winds 5 kt or less. Mostly clear. Waves 1 ft or less. Tuesday: Variable winds 5 kt or less. Sunny. Waves 1 ft or less. Tuesday night: Variable winds 5 kt or less. Mostly clear. Waves 1 ft or less. Temperatures: The average temperature Friday at the National Weather Service office in Negaunee Township was 55 degrees, 11 degree below normal. The high Friday was 56 degrees and the overnight low was 53 degrees. Precipitation: , .01 inches. Year to date, 19.54 inches. Normal to date, 18.94 inches.